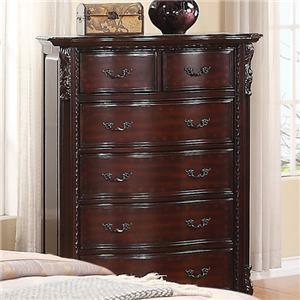 Dazzling mirror accents and elegant decorative hardware make this chest of drawers with five drawers far from ordinary. 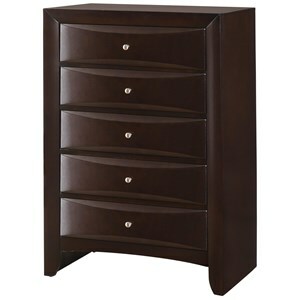 The chest features a top drawer lined with felt to help protect delicate items. 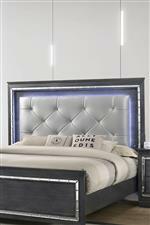 Pair with the matching bed for a glamorous bedroom set. 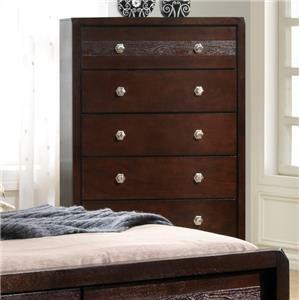 The Perina Contemporary Chest with Mirror Accents by Crown Mark at Casa Leaders Inc. in the Wilmington, Long Beach, Torrance, Lakewood, Los Angeles area. Product availability may vary. Contact us for the most current availability on this product. The Perina collection is a great option if you are looking for Glam Contemporary furniture in the Wilmington, Long Beach, Torrance, Lakewood, Los Angeles area.